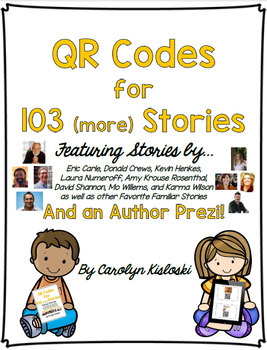 This packet features QR codes for 103 read aloud stories featuring the following authors: Eric Carle, Donald Crews, Kevin Henkes, Laura Numeroff, Amy Krouse Rosenthal, David Shannon, Mo Willems, and Karma Wilson, as well as a section of favorite familiar stories for children. Each video on the QR code has been scanned through ViewPure to remove any ads or distractions. 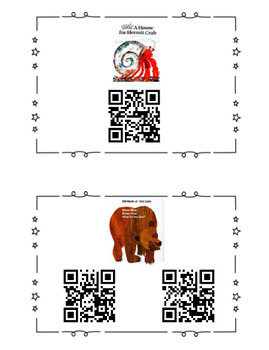 These QR codes can be made into books for wonderful listening centers, or even sent home with students for a fun activities! Each section includes a cover picture and biography page for the author. I make booklets of each author’s QR codes and use them as an Author Study center. 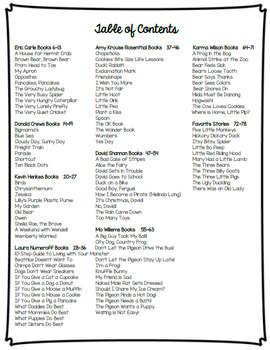 The last section features Favorite Stories and nursery rhymes. 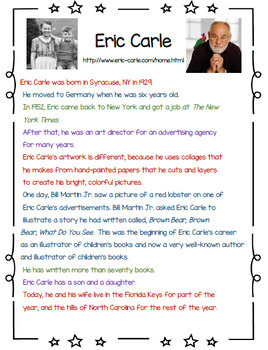 I have also included my Author Prezi, which has links and videos for each author. This is a great addition to any author study.